I have been complaining about winter never arriving in Hot Springs National Park, this morning it dropped by for a few hours. To those of you digging out from under several feet of snow our dusting will not be impressive. 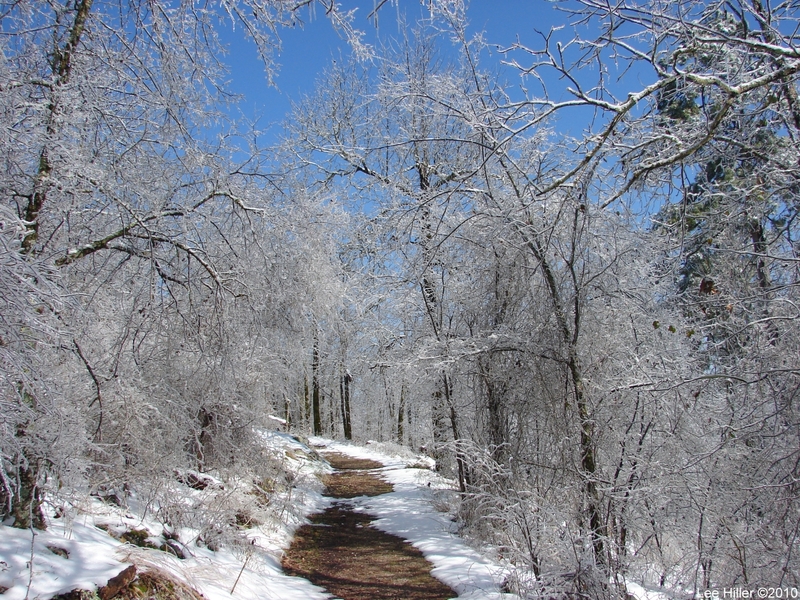 Just the lightest touch of snow changes everything in the Forest as it redefines shapes and boundaries along the trails. The rust Leaves of autumn are beautiful against the white mix of snow and ice. Winter Leaves of red and green become jewels in the winter landscape. 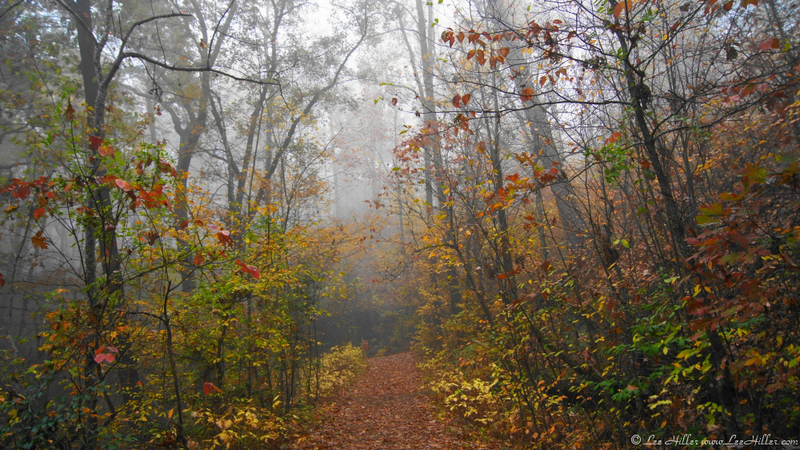 I felt blessed to hike through Nature’s new art work this morning, thank you for joining me via my blog. Many tourists to Hot Springs National Park never leave the Historic bath House Row. Why? The bath houses are the parks revenue source and the longer you stay there the more money they make. 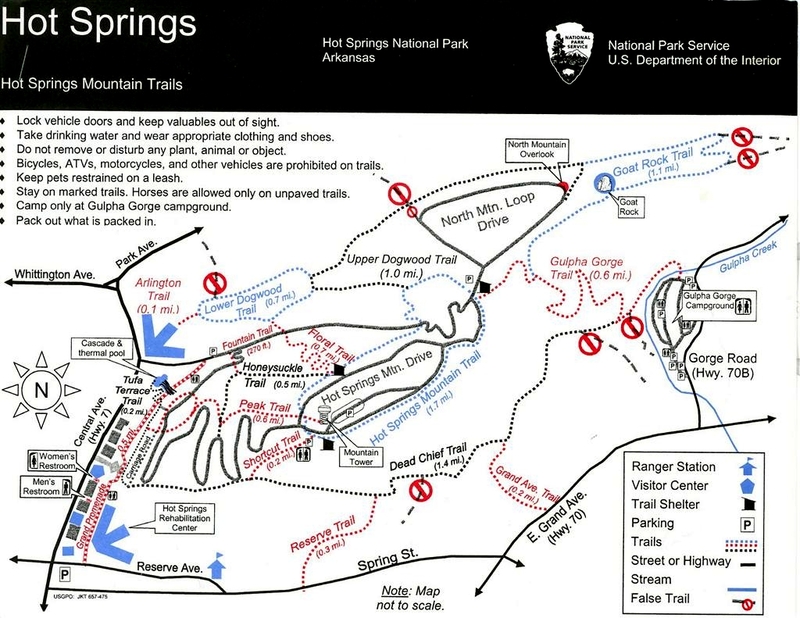 Unfortunately this means many visitors never see the beautiful trails that weave across the six mountains found in the park. 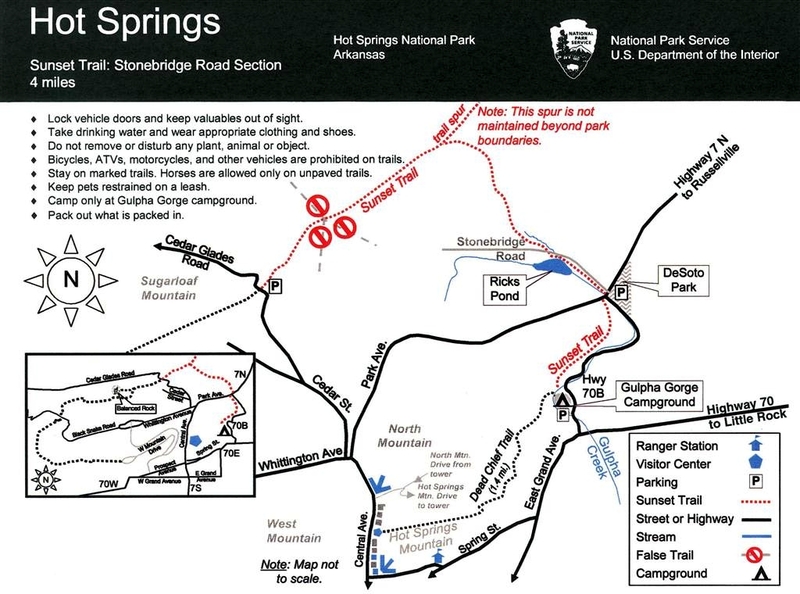 See the five trail maps below. The main mountain visible from the city below is Hot Springs Mountain with its iconic tower for spectacular views. A quick hike up along the Peak Trail and you can reach the tower in approximately 20 minutes depending on fitness level. After you have enjoyed the Hot Springs Tower view hike down to the Pagoda looking out over the valley. 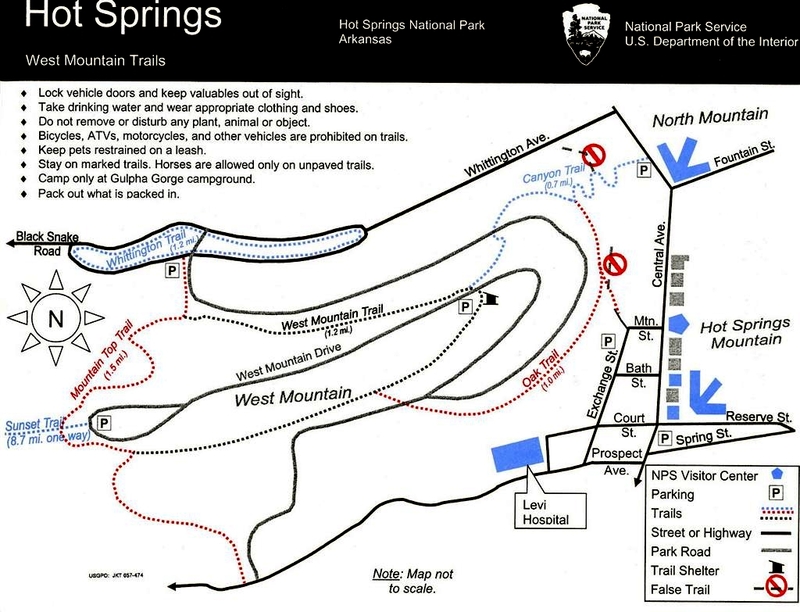 Then take the 1.7 mile Hot Springs Mountain Trail Loop below and then reconnect with the Peak Trail to head down the Mountain. From the National Park campground hike up the Gulpha Gorge Trail and connect with the Goat Rock Trail on North Mountain. 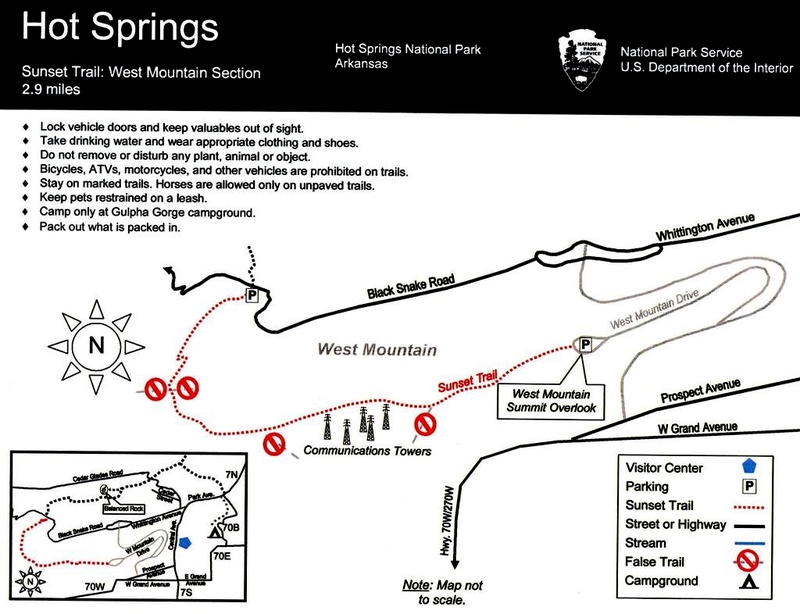 Once you reach the North Mountain Overlook you can head down the North Mountain Road to reconnect with the Gulpha Gorge Trail or hike further on the Upper Dogwood Trail. 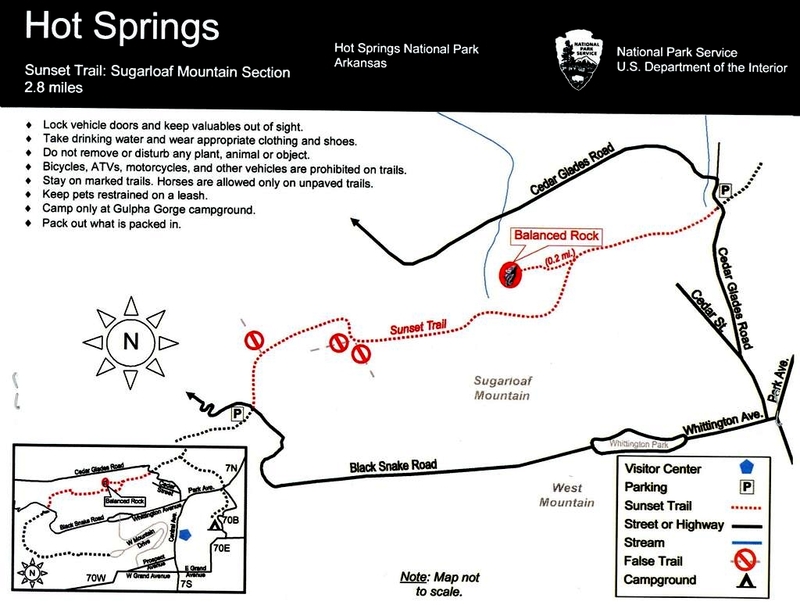 From the campground you can also take the Sunset Trail over to Ricks Pond and continue on the first section of the Sunset Trail Loop. West Mountain can be accessed from Central Ave on the driveway next to the Mountain Valley Water Company. 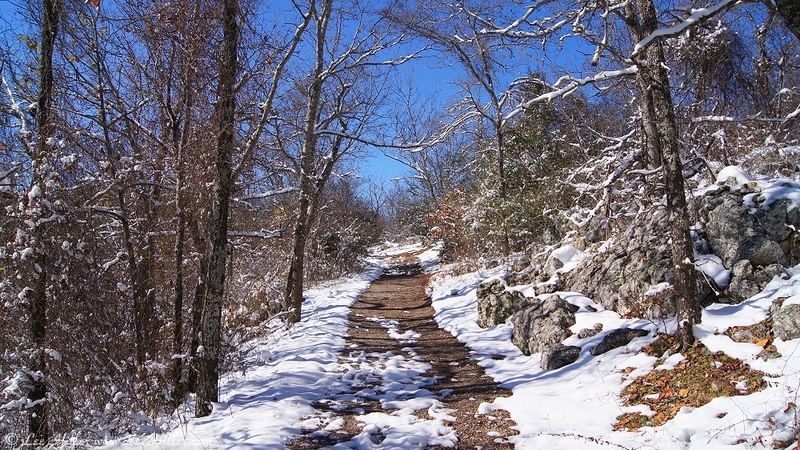 The Canyon Trail takes you to the junction of the Oak Trail which connects you to the West Mountain Trail and the West Mountain Top Loop. From there you can take in the views, continue around the mountain or head out along the Sunset Trail. It is a sunny morning with a very light breeze, I love the feeling of the sun on my face as the wind pulls at my hair. I enter the park and notice the lack of bird song, it is as if something is missing from my heart. I head up the peak trail and notice recently downed Trees from the storms are now bleeding sap. 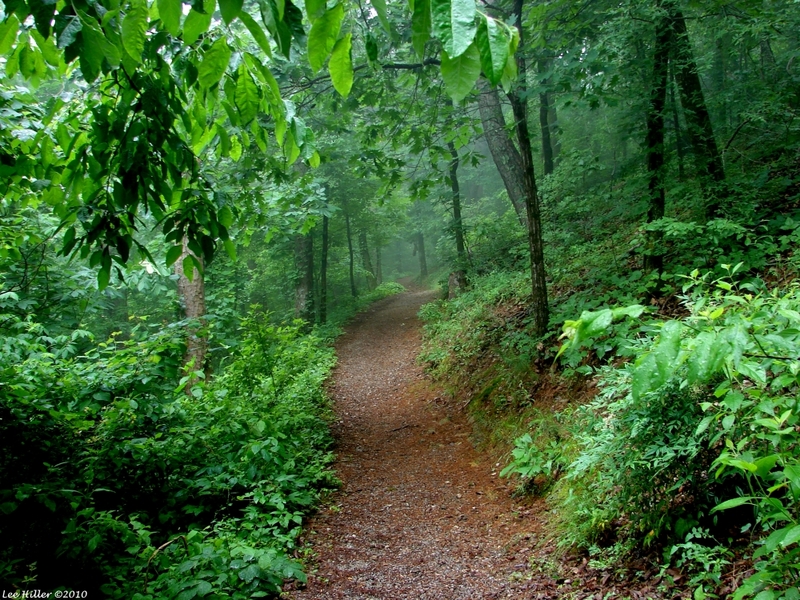 The droplets glitter where the sunlight peeks through the leaves to illuminate the trail. As I reach the top of the Mountain I spot a lovely Red Spotted Purple Butterfly. Torn by time and storms it is still a radiant flying jewel within the forest. Movement to my right reveals a delicate Black-Winged Damselfly. 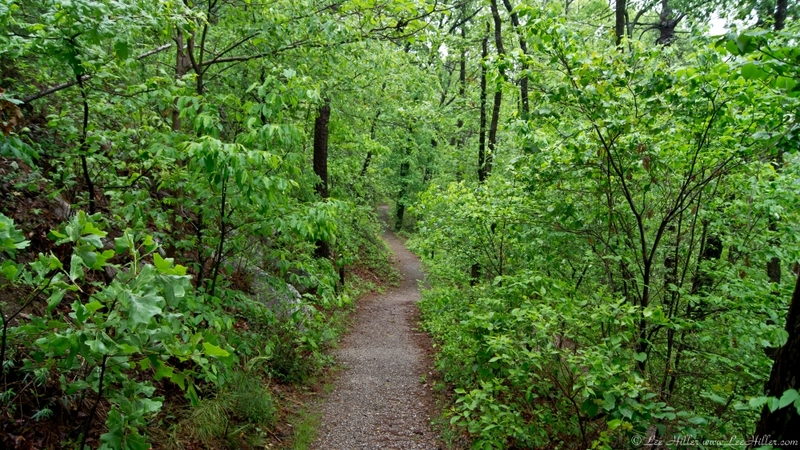 It gracefully moves from leaf to leaf almost as if it is surfing upon the spring breezes moving along the trails. Heading down the Floral Trail the I stop to appreciate the beauty of the Wildflowers. Yellow Lanced Leaf Coreposis rise high to meet the sun, purple Venus Looking Glass and Twistflowers glow on slender green stalks. As I head home along Fountain Street a sweet Squirrel is having a late breakfast. I stand in stillness watching as it dives into the ivy and comes up with a treat. Inching closer I see it is harvesting mushrooms from beneath the leaves and ivy. 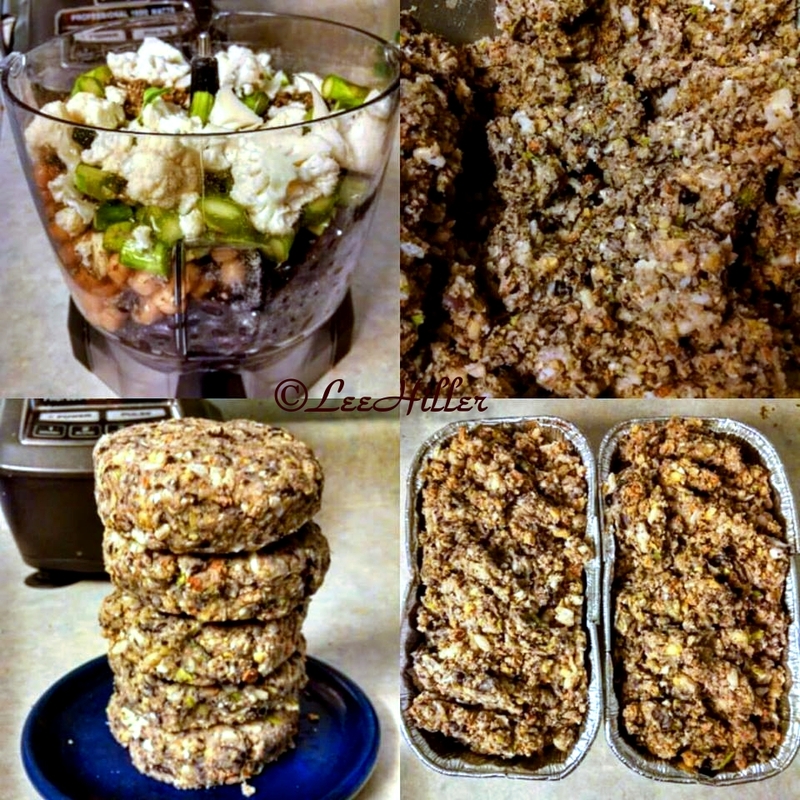 Last year I learned fungi are a favorite treat for our local Squirrels. Passing the Arlington Hotel I hear the sound of House Sparrow babies, along the balcony I spot a sweet bird on a window ledge. I Love how Nature spills out of the park into the surrounding city. My beloved husband Rick is gradually getting his health back after a heart attack and kidney stone procedure last year. He is now venturing up into the Forest after being away for nine months. Our journey today begins looking up to see a spectacular Southern Magnolia in full bloom above our heads. Fully open it exposes anthers and stigmas of cream green and hot pink. Insects are abundant in the late afternoon Forest, they dance across the new green foliage. A large Green Clearwing Dragonfly buzzes past and hides is a cluster of leaves. On the trail I spot a shiny black creature and am surprised by it’s slow movement. Research reveals this is a Sticky Salamander, it is the first Salamander I have seen in the park. The birds are singing to the lowering sun as we finish a wonderful hike across North Mountain and head toward home. It has been a lovely hike in the Forest with my husband. 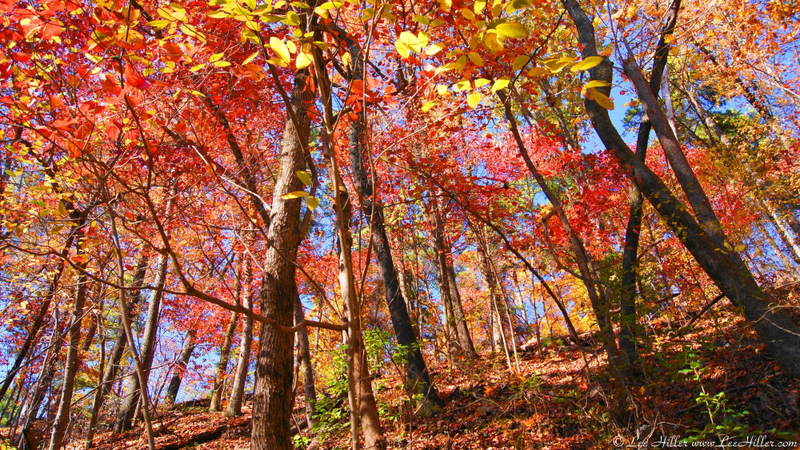 Hike with Joy in your Heart! Time to get out and play!!! As I enter Hot Springs National Park I notice a canvas tent pitched on the Arlington Lawn. A nearby Squirrel having it’s breakfast in the early light seems unfazed by the new structure. We both look at each other and then head off in separate directions. As sign on the lawn indicates the tent is related to a Civil War history display. I head up a path leading from fountain street to the promenade and notice how beautiful the landscape looks in the early light . The nearly 100 year old Fountain Street Lawn stone wall gracefully curves toward the path leading to the Promenade. I often wonder what happened in 1914 that caused so many man-made features to be added to park. Nearing the end of the Tufa Terrace beautiful pink blossoms glow in the dim morning light. A perfect Mothers Day Weekend bouquet of Wild Roses are growing along the path. Although the sun is barely up their pollen is a temptation to a large Bumble Bee. I stop for a moment to enjoy the simple beauty of these blooms. At the bottom of the Peak Trail a Squirrels stands and watches me as I pass by on my way up Hot Springs Mountain. A lovely brown Butterfly (or moth) flies past brushing my face and lands on the path ahead. The Peak Trail wall looms above me as I reach the edge of the Forest. 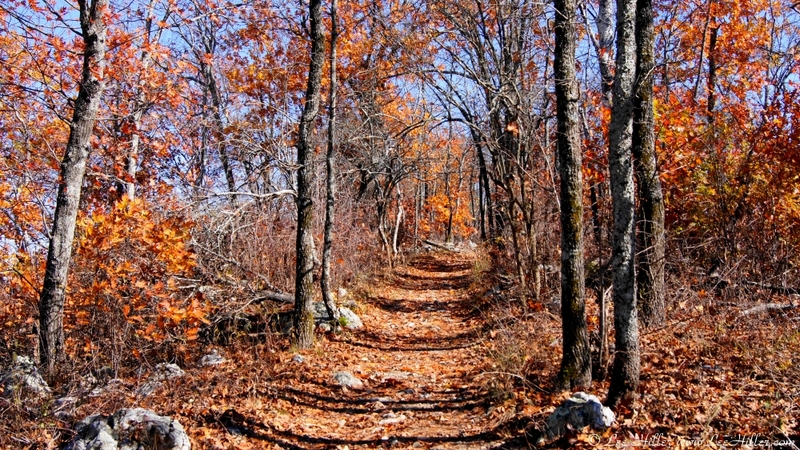 The hike up Hot Springs Mountain is wonderful in the cool breezes and fanning of the new leaves. As I near the top I see a sweet squirrel perched on a branch enjoying a tasty morsel. Lovely tiny white Alpine Bluets line the edges of the upper trail. At the top I take the Hot Springs Mountain Trail, a beautiful blue gray Butterfly dances gracefully over bright green clover. I stop to close my eyes and enjoy the warmth of the Sun kisses my forehead through a gap in the Trees. I am surprised at the empty trails, usually on a perfect weather weekend there are many people hiking. Crossing over to the North Mountain side of the trail I can see many tiny pastel blue gray butterflies hovering above the last of the Blackberry Flowers. They delicately perch and turn on each blossom to find sustenance. At the bottom of the Floral Trail a lively Carolina Wren peers out at me from beneath the leaves of a nearby Tree. While I am looking into the creek flowing at the bottom of the trail a wonderful American Snout Butterfly lands on the opposite bank. I think of reader Lara Buford who kindly often helps me identify the lovely Butterflies I post in my blog. I decide finish up my hike by checking out Civil War Day in the National Park, something new for this northerner. As I head down the Tufa Terrace ramp another event draws my attention… please read Park Wedding Reveals A Moment of Humanity. Sadly there were only two reenactment displays in the park, I had hope to learn more about Hot Springs National Park during Civil War Era. Special thanks to those who did bring a bit of history to the park. As I leave the park I look up to see a couple of large white Southern Magnolia have fully opened. They look so beautiful glowing in the last of the rising morning sun. I Love hanging out with the Squirrels!!!! Happy Earth Day! Please enjoy these photographs taken in the Rainforest on Hot Springs and North Mountains in Hot Springs National Park. The morning was foggy, rainy and windy perfect weather for a hike on Earth Day. I hope you will enjoy the photographs of my hike through the Rainforest. The Universe has been feeding the Forest for several days and now the creeks are full so they will provide a much needed resource for the park residents. What others see as bad weather I see as life, these storms have been a blessing. PS:Note to Hot Spring national Park management… having staff mow down the fields of Wildflowers on Earth Day seemed an odd way to celebrate. Tourists and hikers actually enjoy seeing and photographing the beautiful blooms and you feature them on several pages within your website (Plants, Natural Features & Ecosystems, Outdoor Activities, Sunset Trail). The many insects that pollinate the park feed from their spectacular flowers; including but not limited to Butterflies, Moths, Bees and Wasps. Not sure if your conservation team is communicating with the park maintenance staff, but it might be a good topic to discuss. Wildflowers are as your website states an important part of the Ecosystem.